It used to be so easy. The rule was, unless you could help it, you avoided Canary Wharf completely, and left those windswept concrete canyons to the suits and skirts who worked there. Even today, hardly anyone is traipsing around its soulless "streets" out of choice - you're there because you have to be. 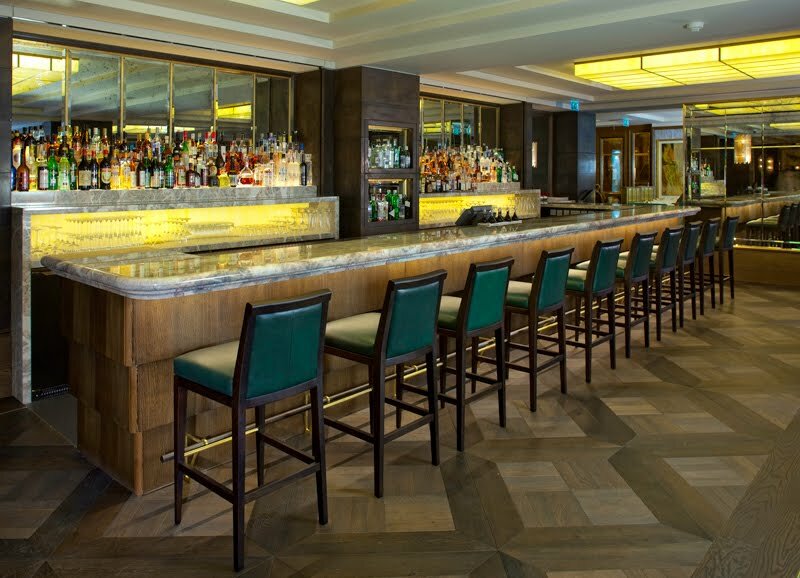 Recently though, if you have found yourself unlucky enough to be in Canary Wharf and out of the office long enough to enjoy a lunch or dinner, the choice is no longer simply between the nearest Pret or Eat, Cafe Rouge or All Bar One. The place still has as much style and charm as a multi-storey car park (and plenty of truly awful restaurants still do a depressingly good trade), but there is a slowly growing number of fairly decent places to dine, even if they do all somewhat conform to the city-boy stereotype. The latest branch of Goodman, which opened here last week, should find a very appreciative audience for its premium steaks and wine list, and despite not enjoying everything I ate at Camino, it's big and noisy and flash enough to fit right in. And now there is Boisdale, a place so unimaginably huge and lavish the only place in the capital it could conceivably exist, and at least conceivably break even, is here in the docklands. It really is hard to fully convey the scale of the place. Split over two floors, each holding a good few hundred people, downstairs boasts a central bar with enormous seafood presentation, with lobsters and oysters and huge legs of Alaskan crab interspersed with the odd bucket of Beluga caviar. Upstairs, an even bigger space has, stretching down one side, a bar the size of an articulated lorry with a good 600 or so different bottles of Whisky. At one end of this room is a substantial stage featuring live music every night, and behind a number of wood-panelled doors are various extra private dining rooms and conference rooms, a huge outdoor terrace, a sealed smoking (sorry, "cigar tasting") room and a climate-controlled walk-in cigar humidor. It is absolutely vast, and quite overwhelming, and yet despite all the very obvious expensive showpieces like the whisky bar and cigar room there is still that rather corporate Canary Wharf vibe that hangs heavy over the tartan carpets and spotlighting. It's partly the size and shape of the place - it's nowhere near small or cosy enough for the member's club atmosphere they're presumably trying for - but it's also the clientele, all of a very specific middle aged demographic and awkward 'office night out' groupings. This may be sheer prejudice talking, but if I notice it there's a good chance you will, too. The menu is, in keeping with everything else about the place, vast and expensive and rather overwhelming. It's also slightly confusing - there are no 'starters', just something called 'Small Plates' which included recognisably starter-y things like whitebait and foie gras terrine next to snacks like dry-fried broad beans. There were 'Salads', though only two, and a section for 'Sandwiches' although burgers appeared under a different heading 'The Grill'. Roast haggis was listed under 'Large Plates' while sausage and mash was under 'The Grill' next to the selection of dry-aged steaks. Finally there's a showy 'Shellfish' section where snacks, starters, small plates and large all gathered together as long as they have a shell and live in the sea. In fairness, all the individual items looked tempting, it just took us half an hour to work out where it all was. Native oysters, in this case "Duchy of Cornwall No.3", were absolutely superb - fresh and crunchy and literally impossible to fault. Which is just as well, as at £18.50 for 6 they were also bleeding expensive. They weren't even the top of the range either - that honour went to some Maldon No.2 which came in at an astonishing £25 a half dozen. Maybe they all came with pearls. Crab tian was lovely, too - perfectly dressed fresh crab with a smooth avocado puree, daintily presented, and so nice that at £12 it seemed like a relative bargain. It was a relief to discover that attention to detail in the kitchen hadn't been lost amidst the gazillions spent elsewhere on stocking a cigar list and sourcing caviar. A 12oz fillet on the bone was £38 - silly money, but actually it was almost worth it, cooked perfectly with a great beefy taste and aroma. I hardly ever order fillet but this was at the recommendation of our waiter and as you don't often see bone-in fillet on menus curiosity got the better of me. The texture is the best thing about this cut; slicing through it is like carving butter, but so often the extraordinary texture makes up for a lack of flavour - not in this case. Even the béarnaise was good, although I wasn't quite as keen on the skin on chips - if I'm paying the best part of £4 for a bowl of fried potato, the least you can do is be bothered to peel them first. After the food, we shifted upstairs for an awestruck audience with the world's biggest whisky bar (probably) and a fascinating Whisky "flight" - 6 quarter measures of some really interesting rare blends and thick, peaty single malts. I don't smoke, so I can't offer my opinion on the cigars (though I can say the room they came from smelled fantastic), but anyone with even a passing interest in whisky could easily spend a happy evening here, not to mention quite easily burn through their life savings if they accidentally picked out a bottle of 1946 Glenmorangie from the line-up. The bottom line is, Boisdale is a good restaurant. 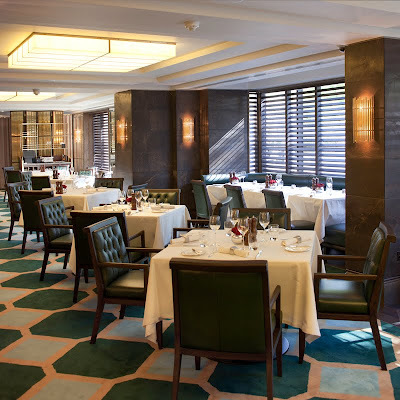 The food is good, the service is good, there are enough nooks and crannies to cover every event from a quick bite to a multi-course slap-up seafood feast to a long evening in chugging cigars and sampling vintage whisky and everything in between. It's huge, but somehow the sheer size of the place allows a variety of ways of spending your time, and doesn't just feel like a cynical method of covering all bases for the maximum possible profit. What it isn't, though, is cheap - God only knows what our bill would have come to had we not been invited, but I'm guessing somewhere in the £100/head mark - certainly serious Event Meal territory. And it's simply this question of value that means Boisdale may not quite be a reason to visit Canary Wharf by itself. It may, however, be a good enough reason not to avoid it. And that, at least, is progress. I'll save you the effort of getting up to speed with this blog's tortured relationship with Degò, and attempt a quick summary. 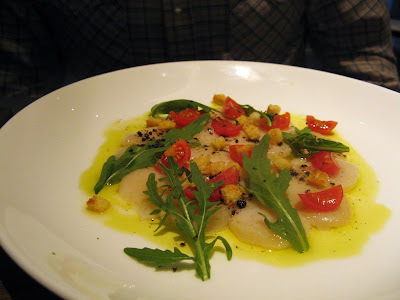 I visited a relatively new Venetian wine bar around the back of Oxford Circus with a friend in October 2010. After suffering an evening of stale bread, bland cheese and dishes that tasted like cat food soaked in olive oil, we were presented with a substantial bill that included service and still left a space for an extra tip. In short, absolutely nothing was right about the place, particularly the strange strip-joint decor, and we hated it. And I said so. And there the sorry little episode would have ended were it not for certain mysteriously partisan comments that appeared not just on my post but on various other London restaurant review sites, all in a suspiciously overly defensive vein and, despite being under different names, often containing the same turns of phrase and same little anecdotes. Then, as if that all wasn't surreal enough, a comment appeared from their own PR, self-proclaimed "restaurant guru" Luisa Welch (other client: the Spaghetti House chain... I'm saying nothing), who decided the best way of negating bad press was to leave an entertainingly prissy rant about my spelling of "focaccia" and attacking my knowledge of Italian food and cheese in particular. In fact, Ms Welch may have had very good points, I just question the logic of saying so, under her own real name, on a negative review of her client. But hey - I'm not the expert here. Either way, the belligerence of their PR only helped to vindicate my initial opinion and very soon my experience at Degò faded like a bad dream, never to be spoken of again. Fast forward twelve months, and Degò, very understandably, has new PR. And not just any old PR either - Lotus PR, who also handle Heston Blumenthal, and presumably know a bit about creating good press, and who responded to my cheeky "well you can't do any worse than the last lot" by bravely inviting me back to see how things had improved. I don't know what it says about me that I didn't take too long to decide to accept - I suppose either dear old Luisa Welch was right all along and I really don't know anything about food, or the meal will be just as bad, in which case it's a fairly miserable evening but at least I get to say I was right in the first place. Who can resist the temptation of a lose-lose situation like that? 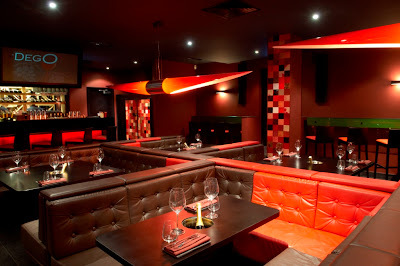 My opinion's unchanged on one thing at least from the first time - the decor at Degò is utterly hideous. Back in 2010 we had spent the evening upstairs in the wine bar area, a room decked out in black Formica with scarlet red detail that brought to mind a cross between an MFI kitchen showroom and Spearmint Rhino's. But downstairs, incredibly, is even worse - more of the same trashy black and red but with two huge flat screen TVs bolted above the bar showing pointless silent looping videos of vineyards, and darkened low booths whose uncomfortably deep leather seats meant that you had to either sit bolt upright and unsupported to eat or slump right back with your legs in the air. I'm told they're losing the TVs soon but I have a feeling they'll have to do a lot more than that to make this a comfortable place to eat your dinner. 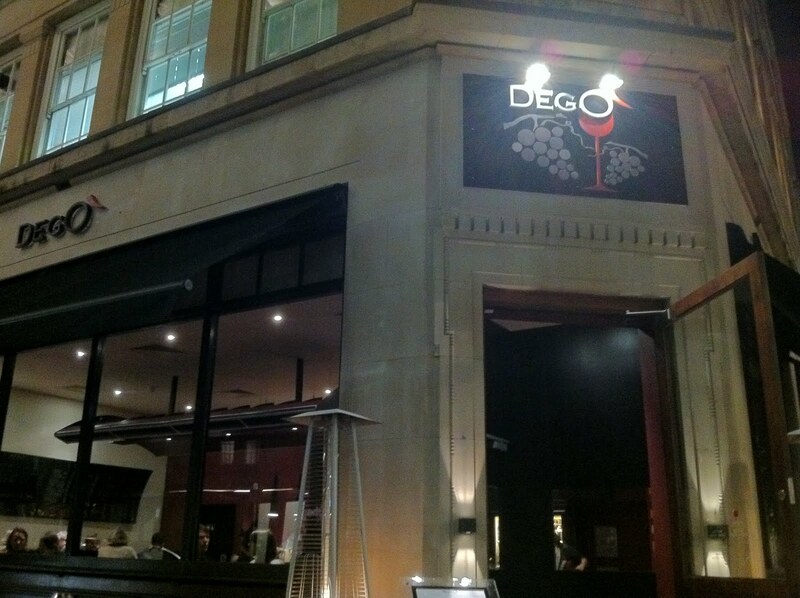 But, some things have changed at Degò. The house bread, so stale and tasteless the first time, was now very nice; even the focaccia (note spelling) which crumbled like old cake before was now bouncy and moist and perfectly seasoned. The selection of house meats, bland and badly butchered then were now attractively presented and full of flavour, and I only tried one cheese this time but it was a very interesting mix of three milk types (cow's, sheep's and goat's) and the contrast with the tray of boring lumps of cheddar-a-likes from 2010 couldn't have been more sharp. "Ah", you're thinking, "but before you visited anonymously and paid for yourself. Of course you're going to be presented with fresh bread and with greater care taken over sliced meats and cheese when you're sat having dinner with their PR guy". And if my meal had ended here, I'd agree with you - it's not difficult to make a bit of extra effort with the charcuterie when you know you have to, and it shouldn't be above any restaurant to improve from the horribly low standards of the house bread from my last visit. But things were about to get a lot more strange. Steak Tartare, using Jack O'Shea's fillet steak freshly minced tableside (a nice, if admittedly quite pointless bit of theatre) was quite lovely - powerfully flavoured cow mixed with a good balance of sweet and sour and crunchy elements. Sadly in London there are still more bland, disappointing tartares than there are any worth paying for, but this was one of the best I've had. And a goat's cheese soufflé was fresh and fluffy, and presented with some leaves of the most brilliant braised fennel, a perfect match to the sharp cheese. Does it sound like I'm picking tricky dishes to try and trip them up? I was. And it wasn't working. Surely a traditional Venician pasta dish would expose Degò for the shallow tourist trap I knew it was? Bigoli is a type of hand made buckwheat pasta, like thick spaghetti. I'd not tried it, or even seen it, anywhere before, but it was quite brilliant - a rich, earthy taste of bucolic Northern Italian tradition, with just enough bite to roll around the mouth without being cloying. But the duck ragu it was soaked in - wow. Rich doesn't even begin to describe just how complex and rewarding the flavour was from this superficially simple looking meat sauce - quite brilliant. Expectations shattered, confidence in my critical abilities shot, reeling from the blows of all my certainties coming crashing down around me in the space of an evening, I had one last chance to try and derail Degò. For my main course I insisted on ordering the T-bone steak - at £54 for 900g this was in line with the prices charged at Hawksmoor or Goodman but surely to God couldn't be as good as either of those? It arrived, it smelled fantastic, I tasted it, it was superb. Expertly cooked (though perhaps without that extra crust of a really hot grill), correctly seasoned, sliced into huge melty, buttery chunks of medium rare and with the same powerful flavour of top quality beef that had made the tartare so special, it was - honestly - a close to perfect steak. It wasn't technically a T-bone, actually - the fillet side seemed to be missing - but I still loved it. So, what the hell is going on here? As far as I know, and I'm told, the same chef and pretty much the entire same team works at Degò today as did in October last year. But I just can't see how the same people who happily signed off that smelly octopus surrounded by pink goo or that balloon of rubbery mozzarella jokingly described as 'burrata' back then could have, in the space of a year, turned things around quite so dramatically. Towards the end of the evening Massimo, the Degò head chef, turned up for a chat and, rather than attempting to cleave me in twain with a 20" cook's knife, which I could understand, explained that in the first few weeks he was mainly out of the kitchen dealing with the various billion-and-one crises that every new restaurant has to cope with and probably wasn't keeping too much of an eye on the food. Which kind of makes sense but then, this wasn't just a disappointing meal we're talking about - my dinner in 2010 was a complete unmitigated disaster, every bit of everything we ate was in some way wrong. Degò hasn't just turned itself around, it's done the equivalent of raising itself from the dead. I still don't know whether to be happy for them or be terrified it may turn again and start actually killing people like some kind of undead restaurant zombie. Who knows what kind of lessons can be learned here - that good PR works, perhaps, although Degò really did most of the opinion changing work for themselves by being suddenly inexplicably brilliant at cooking. That one meal isn't enough to write off a restaurant? Maybe, although I still absolutely stand by my first review, and there's surely an argument that if they are capable of being quite that bad, for however long, they deserve all they get. But here's me giving Degò a second chance anyway, and despite the risk of looking like a biddable PR shill I'm very glad I did - Degò still isn't perfect, but it is at least somewhere near Oxford Circus that deserves your money. And at no point in the last twelve months did I ever think I'd be saying that. There's a very real chance that every single person reading this post already knows everything there is to know about MEATLiquor. If you think #MEATEASY (the short-lived but bright-burning dive bar above a pub in New Cross) was overexposed then the storm of anticipation unleashed by the announcement of the latest venture will have you pondering emigration. But before you do, please consider this: hype, in this case, is not a cleverly constructed PR campaign, nor is it a Snakes on a Plane froth of zeitgeist whipped up by delighted and undeserving protagonists. Londoners are going crazy for MEATliquor because it really is as much dirty, greasy fun as you can have with your clothes on and because the food and the drink are astonishingly good, and astonishingly cheap. So you've braved the queues, you've found yourself a table and you're sipping on a Lagerita (yes, that's the forced marriage of lager and a margerita; it's surprisingly successful) wondering what to order. The short answer, and without a hint of irony, is everything. I've worked my way through most of it in the last week and anything I've not ordered from Wellbeck St I've had either at #MEATEASY or from the Meatwagon itself and it's all, without exception, without question, excellent. 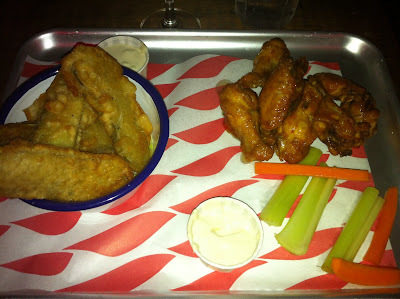 The deep-fried pickles, new to MEATLiquor, are crunchy on the outside and sweet and sharp within, served with a blue cheese dip that contains nice big chunks of strong salty cheese in tangy sour cream. And it would be silly not to also get a portion of Buffalo Wings, also expertly fried to crunchy/moist perfection and coated in an addictively tangy hot sauce (though not, as it turns out, the usual Frank's - this is a custom order from somewhere in deepest Peckham, details of which are, in the traditional Meatwagon style, kept well under wraps). And let's not forget the burgers. 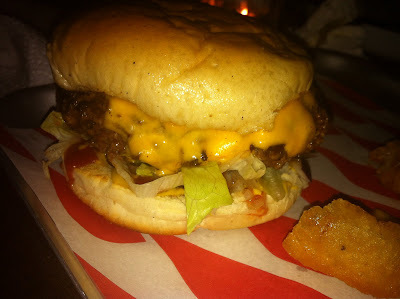 The Dead Hippie is the MEATLiquor's take on a Big Mac, but that glib description does it no justice at all. A heaving, juicy pile of two beef patties soaked in luminous yellow cheese and encased in a glistening soft golden bun, it is doused with their own version of the special sauce (mayonnaise and ketchup, perhaps, with chunks of white onion) and is absolutely glorious. No less glorious is the chilli cheeseburger (if the phrase "butter-fried chillies" doesn't get your pulse racing, not to mention your arteries hardening, nothing will), the bacon cheeseburger (the bacon is boiled, pressed then fried on the hot plates, making it crumbly and crunchy and intensely porky) and the Double Bubble double cheeseburger, so fresh and sealed with such intense heat that you could make a soup out of the juice that pours out of it on every bite. The draw of MEATLiquor doesn't end at the food, of course. Cocktails, provided as in New Cross by the enormously talented SoulShakers, are, just like everything else, inventive, delicious and surprisingly good value. I can particularly recommend the English Breakfast martini which comes with a pickled quails egg on a stick coated in some kind of bacon-flavoured breadcrumbs, and spare some room too for the Lagerita's cousin the Ciderita, the ingredients of which I'm sure you can take an educated stab at. But you know all this, everyone does. You've heard it all before. The fact they can still come up with the goods on a much larger scale with such a high level of consistency is delightful, perhaps, but it's not news. 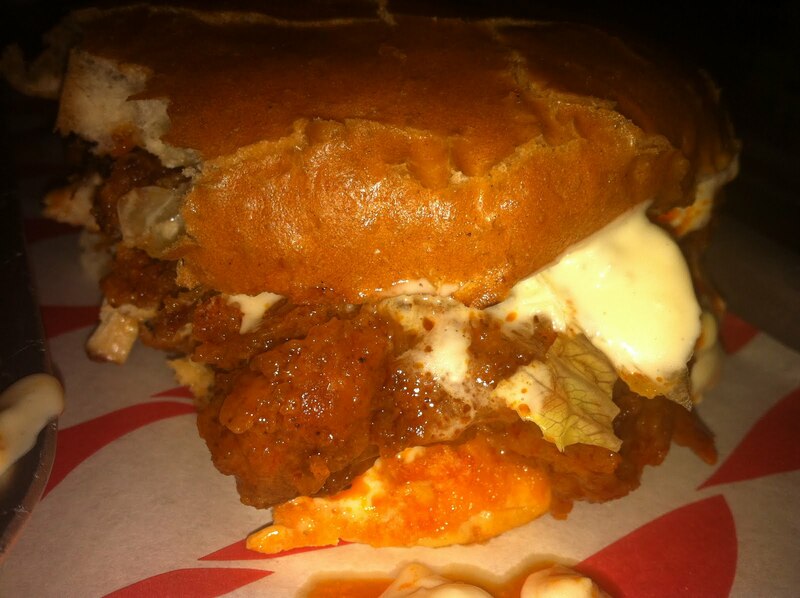 But let me just tell you about one more thing - the Buffalo Chicken Burger. Deep-fried chicken breast coated in some kind of crunchy batter, soaked in the Buffalo sauce, smothered in mayo and encased in those same glossy, firm rolls, it is unbelievably good. The chicken itself is juicy and, for want of a better word, very "chicken-y" - these are no KFC broiler animals - but it's the coating that makes it, crunchy and caramelised like bubbly tempura, but fiercely flavoured with vinegary hot pepper. The mayo mellows out the hot sauce without being sickly, and the only salad is some shredded iceberg to add colour. It's a work of art, a true masterpiece, my latest all-consuming obsession. It is also a tantalising glimpse of a larger menu that will be rolled out in the coming weeks (there are fevered rumours of something called "Dirty Fried Chicken"). 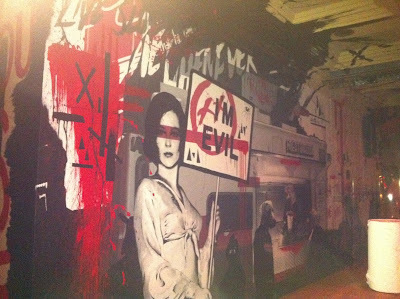 Just as there are those who claim they don't like the Beatles, who have never seen Star Wars and who think Shakespeare is overrated, you will hear people boring on about how they can't see what all the fuss is about MEATLiquor. These people will, most likely, be the ones rolling their eyes dramatically at every mention of the place on Twitter, huffing and puffing about herd mentalities and - yes - "hype", and stubbornly avoiding heading to that strange, dark place under the car park round the back of Debenhams in mortal fear they might actually enjoy it and their entire world will collapse around their shoulders. But you know what? That's fine. 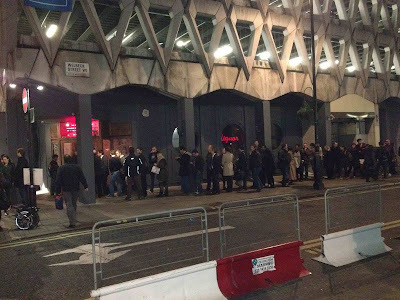 MEATLiquor isn't for everyone - it's noisy, brash, calculatedly seedy and, just like #MEATEASY, there's a good chance you'll have to queue. It's also completely and utterly brilliant. I'd say that was worth a bit of a wait, wouldn't you? Going to a smart restaurant in one of London's most expensive hotels and then complaining about the prices could be considered one of the more futile crusades a food blogger might engage in. I am certainly not, at least traditionally, the Rib Room's target audience - it's not just that I don't like spending £150 on dinner without a cast-iron guarantee everything will be excellent, it's not even that I feel slightly out of place in this most glitzy of surroundings. It's simply that in a more general sense, the Rib Room isn't "me". I would never have gone had I not been invited, and despite having enjoyed a perfectly decent evening I am almost certain never to go back. There was nothing drastically wrong with anything (well, there was one thing, but more on that later), but I just know there are better ways of spending that kind of money - call it a blessing or a curse. To be fair to the guys behind the Rib Room, they have clocked on that basing their business model on a group of ageing Belgravia locals isn't a recipe for long-term security and have used a recent refurb as an opportunity to lower their prices to a slightly more egalitarian level. The problem is, whereas before the prices were "offensively high" (a £60 British fillet steak for one sticks in the mind), now they're just "high", and while most of the food we tried was very good, it's still hard to see past the numbers attached to them. Half a dozen rock oysters were a little too bloated and creamy for my liking - I don't know what it is that occasionally causes rock oysters swell up like this (spawning season? ), but I find the sensation of bursting a bag of white bivalve innards in my mouth ever so slightly disturbing. They came with a very nice Virgin Mary shot though, which helped cut through it. 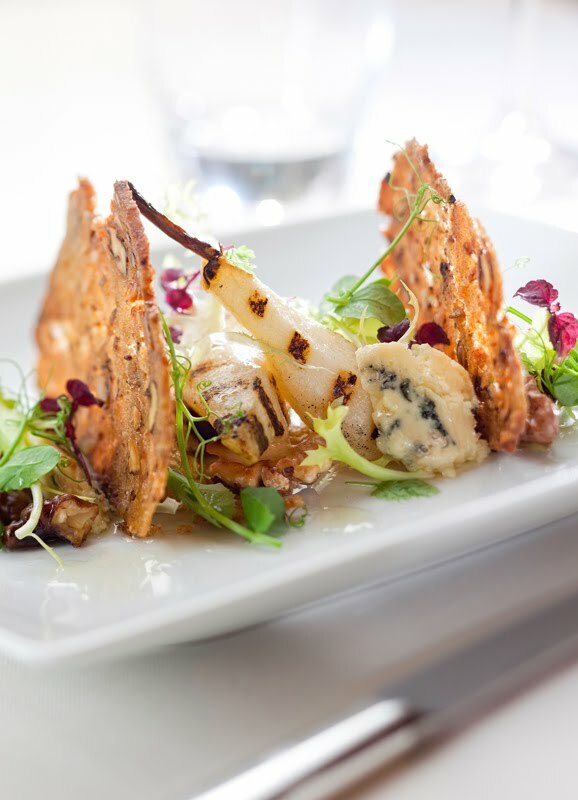 A pear and Stilton salad was really good, and one of the relative bargains on the menu at only £9.50. Beautifully presented (this is a press shot but it did honestly look just like this when we had it), studded with crunchy toasted walnuts and hunks of oozing honeycomb, it was a dish that satisfied on every level - the sweet honey combining with the salty cheese, the crunchy melba toasts with the soft slices of chargrilled pear. I can hardly remember a better or more attractive dish calling itself a salad. But then, the steaks. 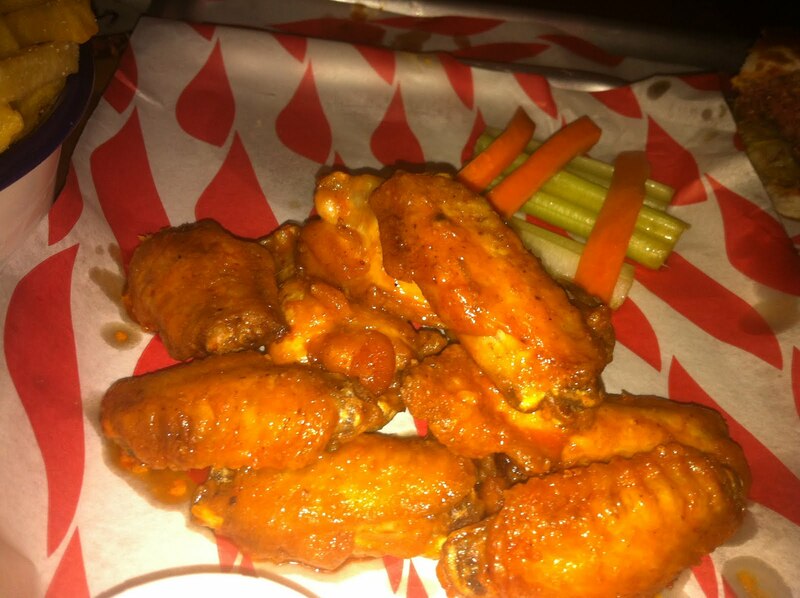 For a restaurant called the Rib Room you'd hope that these would at least be interesting enough to carry the flag, and superficially they looked decent enough, nice and thick and with something approaching a dark char. But looks were sadly all they had going for them - they each tasted watery and bland, like any bog standard £10 pub offering, and while my ribeye was just tender enough, a friend's sirloin was incredibly dry and chewy, really rather unpleasant. And there's the little matter of cost, too - the 250g ribeye was £26 and 250g sirloin was £29, a huge markup for what was very obviously commodity Smithfield market standard meat. I've never heard of Aubrey Allen before (the beef supplier) but I made a mental note to avoid them in the future. Thankfully, a very enjoyable dessert of macerated oranges and vanilla ice cream went some way to obliterating the memory of the mediocre steaks. With bold flavours and more clever use of honeycomb for texture, this was thankfully more on the level of the starters than the mains, and - you'll have to take my word on this one - presented very well. And a cheese course consisting of five cheeses all from the same Sussex farm and all pasteurised would not normally have set my pulse racing but these were surprisingly good and although I'd like a bit more variety I'd say the Rib Room's bold decision to put all their eggs in one metaphorical basket just about paid off. Unpasteurised would have been better of course, but you can't have everything. I have just finished reading Mark Kermode's book The Good, the Bad and the Multiplex. In it (bear with me, this is going somewhere), he describes how it is almost impossible for a blockbuster movie to lose money - throw enough special effects, explosions, internationally famous movie stars and McDonalds Happy Meal tie-ins at more or less anything and people will flock to see it, just to be part of the "event". If people were that fussy, any number of straightforward summer movies trotted out by the big studios over the years (Godzilla, Green Lantern, Tron: Legacy, you name it) would have been catastrophic flops - in fact, all of these were, financially at least, successful. The Rib Room is a Blockbuster Restaurant - millions have been spent on the revamp, it's in the poshest part of town, the menu is crowdpleasing in that "all bases covered" kind of way and the service is slick and professional. And on Friday night every table was taken, not with trend-chasing food geeks like me but with comfortably moneyed Belgravia locals who were enjoying a perfectly nice evening surrounded by all the crystal and silverware they could want. The Rib Room, as I said, isn't me. And for that reason, I'm sure it will do very well. Before I get down to the dirty business of explaining just why my meal last night was so mediocre, I'll try and start on a positive note. Because, trotting through Knightsbridge on a bright summer's evening on my way to a restaurant that much better men than me had raved about, I certainly was feeling positive, at least initially. 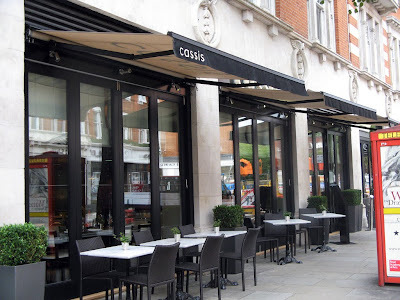 Cassis opened in November last year, and ten months seems like a very decent bedding in period - not short enough to catch early day technical or service issues, but not too long for the staff to lose any of their opening months drive and ambition. It's a pleasant room, too - bright and comfortable with a healthy chatter even with only two or three tables occupied at 7pm. Staff were professional, if a bit... tetchy (more on that later) and I liked my foie gras starter. And the toilets were quite nice. And... yes, that's the sum total of everything I liked about the place. The very first thing we ordered was a Margarita - a £13.50 Margarita too, from the "premium cocktails" list, which I think contained a fancy tequila and Mandarine Napoléon instead of the more usual triple sec. "That's a lot of salt" my friend said as the drinks, after a good ten minute wait, eventually arrived. Each glass was coated a good half inch inside and out of the rim - enough to make your throat go dry just at the sight of it. But it was only when I attempted to clear a path through the "salt" to the drink with my finger that I realised that it wasn't in fact salt but sugar - lots and lots of sugar. Understandably, we assumed the barman had made a mistake and mixed up his condiments, but just as we tried to send them back we were told that the sugar was, in fact, intentional - they actually meant to serve us a Margarita with sugar. It was, of course, revolting - way too sweet, and with large chunks of broken ice floating around because they'd used the wrong filter while pouring. I wouldn't come to Cassis for the cocktails. But on to the food. House focaccia was cold and oily, although the brown bread was better so we just stuck to that. 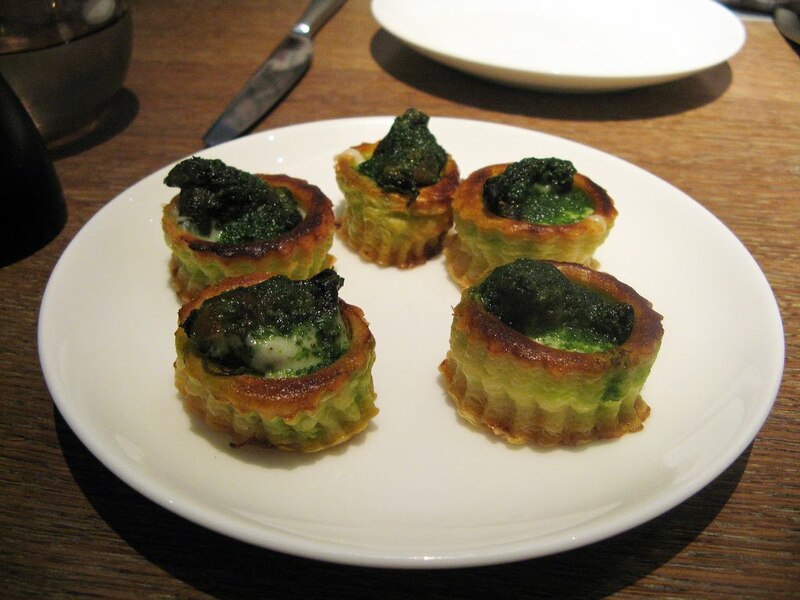 Some little snail vol-au-vent things ("Pastis flambéed snails, puff pastry and garlic butter", £5.50) were greasy and tasteless, the snails doing nothing much more than providing texture, and texture isn't exactly a snail's strongest suit. I've had some very tasty snail dishes over the last year or two - I'm thinking particularly of a snails and meatballs dish at Bistrot Bruno Loubet which was magnificent, and although it's not quite in the same price scale a snail starter at Gordon Ramsay - but this was a real waste of the poor little blighters. We did mention our issue with them (as politely as we possibly could) to our waitress, who looked more annoyed than apologetic, and didn't take anything off the bill. And I could just be paranoid but I got the distinct impression from that moment onwards our service got decidedly cool - we noticed on a couple of occasions waiting staff having discussions just out of earshot and casting significant glances towards us, the difficult couple who didn't like the snails. It was uncomfortable and rather odd. In the context of everything else, "Pan-fried Landes foie gras, caramelised kumquat, sesame tuille" (£17) was surprisingly good. 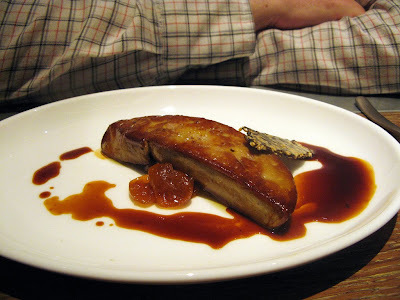 A huge slab of perfectly cooked and wonderfully smooth foie sat on top of a sharp kumquat chutney to balance out the fat, and was hugely enjoyable. I've had stringy, mealy foie at the fanciest places (such as Alaine Ducasse at the Dorchester) but this was pretty much perfect, even if you would hope so for £17 for a starter portion. My friend's octopus carpaccio (£9) was less good though - the octopus itself was alright (though no more than that) but the plate was dressed weirdly with cold, oily croutons (why? ), plain rocket and cherry tomatoes. And there's not much more boring than rocket and cherry tomatoes. "Roast suckling pig leg, girolles" (£22) sounded exciting on paper (or rather, the daily specials chalkboard), and indeed the pig flesh was beautifully cooked to moist perfection, even if the skin was thin and crackle-free. But the sauce it sat in was over-reduced and bitter, and not particularly pleasant. Worse still was a scallop carpaccio (another chalkboard special, £22) containing bland scallops that would have been bad enough even if they weren't dressed exactly in the same way as the octopus, with oily croutons, rocket and cherry tomatoes. Snore. Desserts were ordered more out of hunger than optimism. My strawberry tart (£8) was OK though, light soft pastry containing a tasty fruit mousse. 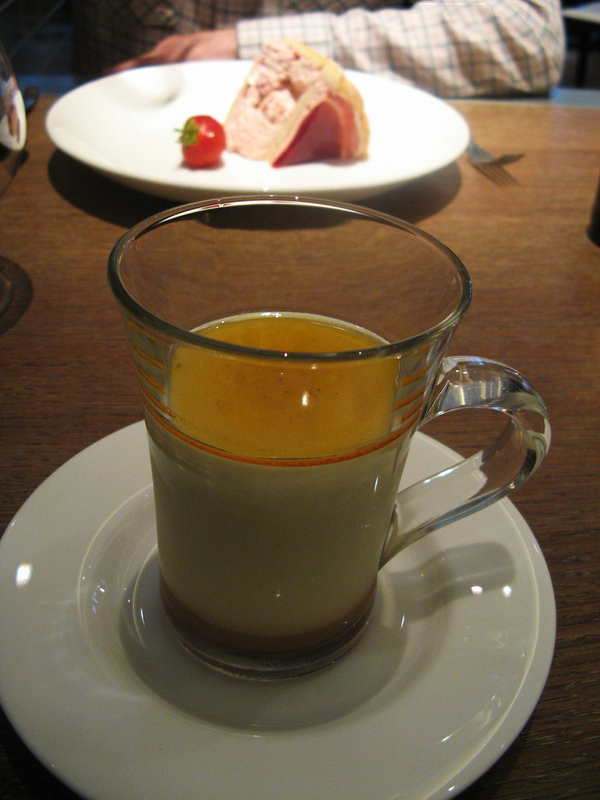 But Creme Caramel (£7), served in an Irish Coffee glass for some reason, was runny and wrong, the bottom half of the glass seemingly consisting of nothing other than tooth-rottingly sweet liquid caramel. If it sounds like I'm picking fault wherever I possibly can, then perhaps that's only because a combination of the service, the prices and the fact that almost everything we ate was somehow at fault made that possible. 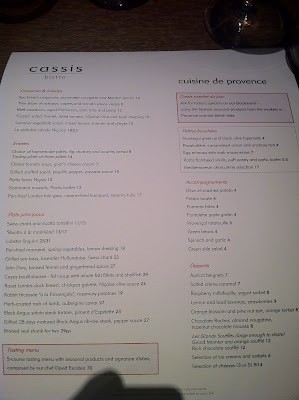 In all fairness, the service did improve towards the end as a more senior (and friendlier) waiter took over, and I am prepared to believe you could go to Cassis and, if you steer clear of the cocktails and the carpaccios, construct a fairly decent dinner for yourself. But I am also a firm believer that it should not, at these kinds of prices (our meal came to £100 a head with 2 glasses of the cheaper wines and a digestive each, which could have got us a tasting menu at the Ledbury for God's sake) be possible to order this badly. And it is not, in the end, our fault that we didn't enjoy it - it was theirs. Somewhat foolishly, and prematurely, I decided back in January that 101 Thai Kitchen in Hammersmith was as good as Thai food gets in this country. I don't know what posessed me really - I knew in my heart of hearts that this still wasn't the meal I was looking for, still wasn't anywhere near approaching the fire and flavour of any dish I'd ordered roadside during a month-long trip around Thailand a decade ago. But at the time, 101 was as good as I'd tried and it suited my dwindling prospects of ever finding anything better to use it as an excuse to stop looking. 101 is very good, of course, it's just not quite actual Thai - it's London-friendly Thai, toned-down, lukewarm, safe. The Heron is not any of these things. In fact, the Heron is so unlike any other Thai meal I've ever had in the UK I'm still not entirely convinced the building doesn't conceal some kind of wormhole to Bangkok - I'm distinctly heard the whine of a Tuk Tuk and the swish of a riverboat every time our waitress disappeared into the kitchens. The phrase "a little slice of Thailand in London" is massively overused when it comes to describing any old mediocre pad-Thai-and-spring-roll peddler in the capital but this really is the real deal, from the tables of happy Thai ex-pats to the functional plastic furniture, to - yes - the food. Oh glory be, the food. As a "snack" while waiting for others to arrive, we ordered a dish of chilli cashews. Mixed in with spring onions, shallots, blazingly hot red chillies (which we swiftly learned to circumvent) the real stroke of genius were tiny studs of lime which judging by their diminutive size and soft texture could well have been fresh Kaffir limes, although I'm happy to be corrected on this. If you managed to get all the different elements together in one spoonful, it was a marvellous balance of crunchy and soft, citrus and sweet, freshness and fire. Embarrassingly, given the events that were to follow, we had to double check with our waiter that he was indeed giving us the "authentic Thai" levels of chilli heat when a bowl of orange curry (containing prawns and chunks of a kind of vegetable omelette) turned out to not quite be as fiery as we were expecting. It was very nice - sweet and sour with the emphasis on sour, and the broth was rich with chunks of prawn and a sharp green herb of some kind, it just wasn't particularly challenging. And then the laab ped arrived. On taking your first mouthful of the Heron's laab ped (minced duck salad, for want of a better translation, though that hardly does it justice), the initial response is delight at this supremely masterful combination of Thai flavours and textures. There's the sweetness and citrus hit of lemongrass, the rich crunch of spring onions and shallots, the herby hit of fresh Thai basil, the dense meaty goodness of minced duck, and - oh yes - I think there's a bit of chilli there. Hang on, that's quite a lot of chilli. Wow, this is - holy God I can't feel my face. Hidden in amongst the mince like silent assassins are teeny red devils which, if you don't locate and isolate them with surgical precision, create absolute hellfire. The five of us, each hardly a stranger to a bit of heat, were reduced to frothing wrecks, desperately knocking back mouthfuls of Singha in an attempt to keep a lid on the pain. It only partially worked. From here on, and once we realised we had survived the laab ped with only minor internal damage, the meal was a panting, sweaty joy. An unusual dry catfish salad (Yum pla duk fuu) was like a big fluffy fish biscuit, and soaked up the sour dressing most satisfyingly. Som tam Thai + poo was papaya salad containing chunks of extraordinary powerful chunks of fermented pickled crab - I can't think of a better way of describing them than saying they smell a bit like standing on a beach on the South China Sea next to a raw sewage outlet, but in a good way - they season the vegetables in the same way as nam pla (Thai fish sauce) but in a dirtier, earthier manner. 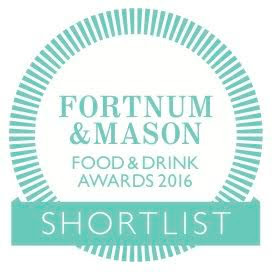 This was certainly uncompromisingly authentic food, unique and vibrant and exciting. Yum nhaam, a sausage salad from North-Eastern Thailand, was very interesting, the meat being cold and sour instead of hot and fatty. A daily special tom yum soup had that familiar sweet and sour feel but was studded with chunks of slow-cooked hock which added an increasingly intense porky flavour as the broth reduced over the flame. And a fantastic plate of stir-fried clams was as good a seafood dish I've had in any SE Asian restaurant, the sweet bivalves coated in a thick, dark sauce that I can't even begin to guess what went into. Almost my favourite thing overall (possibly tied with the Devil's Laab Ped) was a plate of minced pork and century egg (Kai yiew mar kra pow krob) which, ironically, was one of the milder dishes in terms of chilli heat but had an unbelievably rich combination of pig fat and silky, jellified egg. It seems that where the dishes weren't catastrophically, explosively chillified the flavour was bumped up in other ways - stronger or more unusual earthy notes (the pickled crab, or the preserved eggs) or using citrus & sour to stunning effect (the cashew snack). 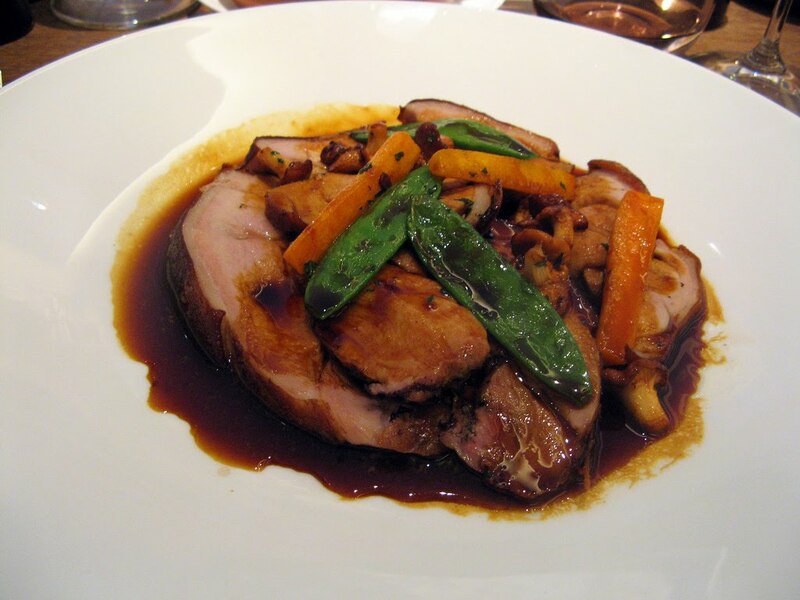 Every dish was balanced and considered and cooked to perfection - there was no menu padding, no lazy substitutions of meat in the same sauce, nothing that wasn't a complete and wholly successful combination of flavours and textures. For sheer, exhilarating Thai authenticity, then, I am convinced you can't do any better in the UK. But on that same note, food this challenging isn't for everyone. As we moaned and groaned (equally in pain and pleasure) our way through the last morsel of laab it dawned on us that other than a few other obsessively foolhardy foodies there probably weren't many people that could cope with quite this amount of catastrophic heat or uncompromising flavour (or, for that matter, the price - at £36 a head with admittedly a lot of food but only a couple of beers each it's not that cheap). But herein lies the Heron's greatest achievement - to bring Thai food, real, actual Thai food to London without bending even slightly to local tastes. It is the reason it probably won't expand out of a strange, strip-lit basement room in an estate pub in Paddington, but it is also the reason it's one of the best meals I've had anywhere this year. If you've got the stomach for it (and believe me, based on the last 12 hours I've just had, I'm not completely sure I do) then here, finally, is what you've been waiting for. If not, I'm sure it's only a short trot to your nearest Thai Square. The choice, and the challenge, is yours. 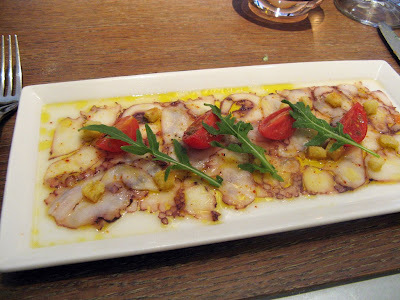 Many thanks to Hollow Legs for reminding me what we ate last night; her report of the meal is here. We are also massively indebted to London-based Thai blogger The Skinny Bib and this astonishing post, in which he helpefully translates into English the entire menu! Take a printout if you're planning a trip yourself.